It was announced in the second 2016 edition of Shogakukan’s Sho-Comi magazine that Go Ikeyamada (author of So Cute it Hurts!!) will be launching a brand new romantic comedy manga in January called Sekai wa Nakajima ni Koi wo Suru (The World Loves Nakajima.) 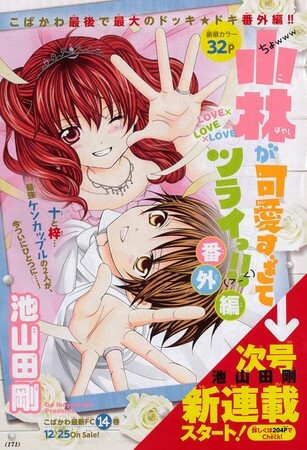 The manga is set to debut on January 5, 2016 in the magazine’s combined third and fourth issue. The manga will be featured on the magazine’s front page, will contain a color opening page, and the first chapter will be 55 pages long. “Among the billions of people in the world, I will find you. Her recent work, So Cute It Hurts!! ended its run in Japan back on November 5, 2015. The 14th and final volume of the manga will be released on December 25, 2015 and is currently licensed in North America by Viz Media in which four volumes have been released already. The manga received an OVA Anime which was bundled with the manga’s third volume and second OVA which was bundled with the sixth volume.